The Sysmex® DI-60 Integrated Cell Image Analyser provides complete automation of your manual WBC differential process. 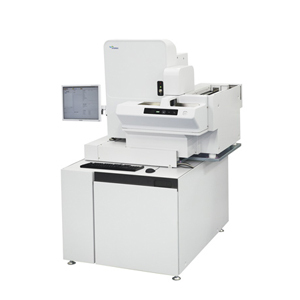 With the DI-60, you can integrate CBC analysis, slide preparation, slide staining and digital image pre-classification of cells in a complete workcell. Now you can free highly skilled medical technologists to spend more time on the difficult cases that require careful analysis and assessment. Automated Cell Image Analysis provides a more standardized differential result and extensive network connectivity to enhance the level of service your laboratory provides clinicians and patients. The automatic cell location and pre-classification provided by the DI-60 improves the process of performing differentials, resource utilisation, and clinical collaboration. Your assurance of quality can be enhanced with complete traceability of patient results down to the level of each individual cell image. The DI-60 can be connected to the XN-9000 or XN-3000 systems to create a fully integrated automation solution for your laboratory.